Description: An original Acrylic painting by Lesley Finney on a 1.5” box canvas with painted sides in dark Blue. 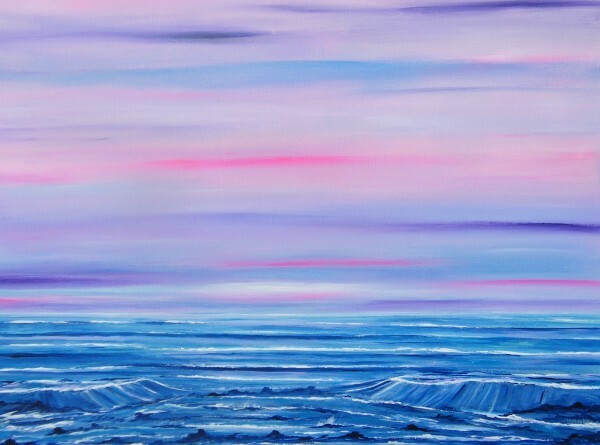 A contemporary seascape which helps to create a more relaxed environment due the use of pastel shades - Blues, Lilacs and Pinks. This piece would make a great addition to any room and relates to the Mythical Greek God Poseidon who was said to have ruled over the Ocean/s deep. The painting comes signed and dated on the reverse. There are photos showing Neptune's playground in a room setting - please note the artwork is not to scale in these pictures - thanks.